I have seen a lot of bugs since moving to Shanghai, but never have I seen ants this big. Or this colorful. 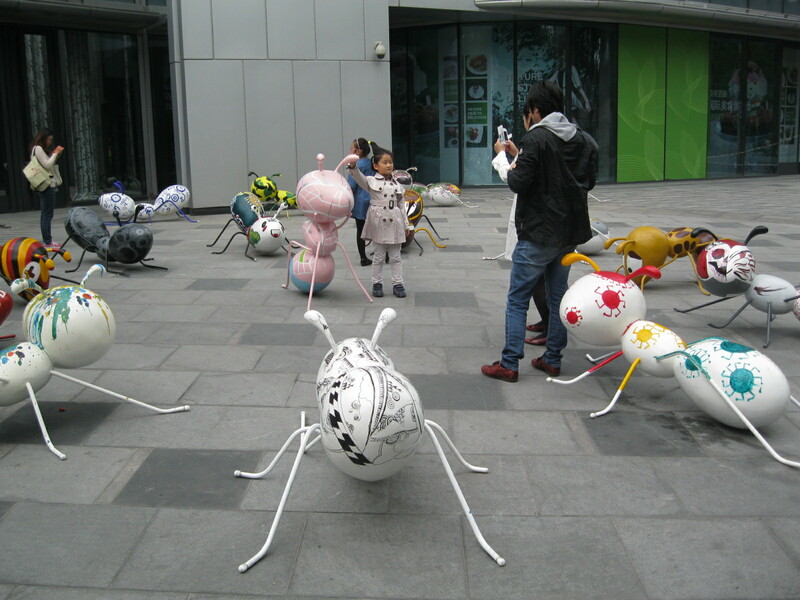 The giant ants comprise a small sculpture exhibit located outside a mall on West Nanjing Road (just west of the intersection with Huashan Road, if you’re in Shanghai and want to check them out), and I spotted them while riding the bus last week. I didn’t have a chance then to investigate further, but went back over the weekend to take a look at the ants up close. 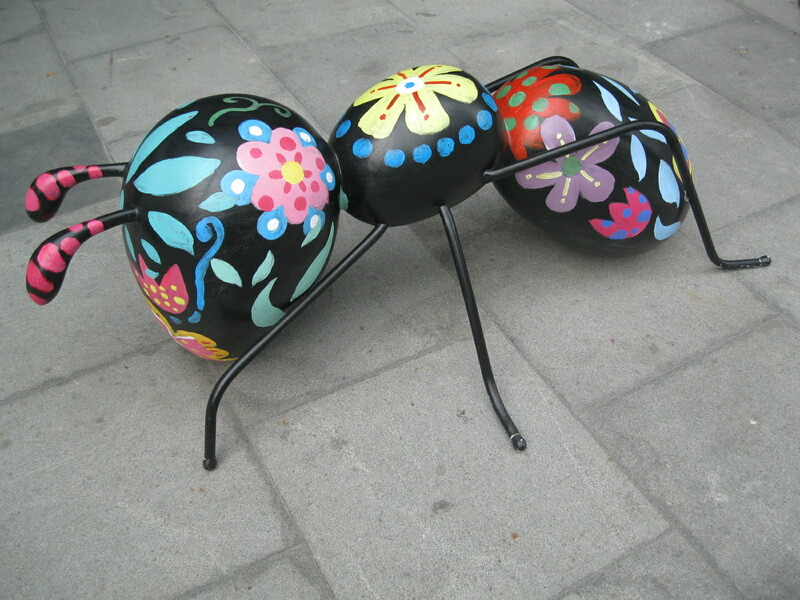 Each three-foot-long ant is painted with a different motif, in the style of the CowParade public art exhibit that took Chicago by storm back in 1999. Who painted the ants? I have no idea. I looked around for some sort of placard that would explain the exhibit and identify the artist(s), but if there was one, I missed it. I was the only one of the dozen or so adults viewing the sculptures on Sunday afternoon who didn’t have a preschool-aged companion. The exhibit is very popular with parents and grandparents, who pose their (grand-)children with the ants and whip out their cellphones to take a few snapshots. Though virtually every child I saw instinctively tried to sit on the ants (they’re the perfect size for a four-year-old to “ride”), a security guard was quick to reprimand them. Touching or hugging the ants for photos is okay; sitting on them is not. Why ants? What are the different designs meant to express? I don’t have a clue. Most of the ants are painted with patterns, though a couple of them display pictures of objects or scenes instead. 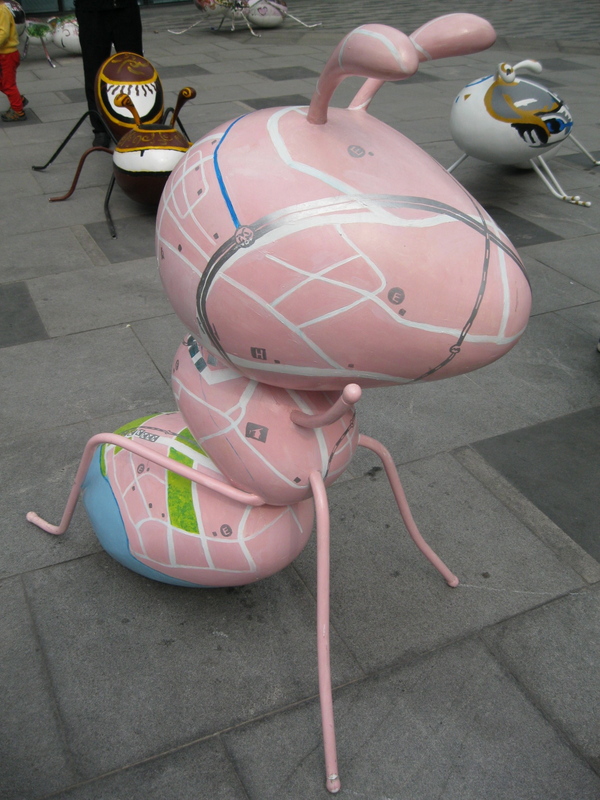 I think the large pink standing ant that served as a kind of centerpiece for the exhibit has a map of Shanghai painted on it, but I wasn’t able to examine it closely enough, or long enough, to verify that—it was the most-photographed ant in the exhibit, since its upright stance meant that kids could easily hug it. 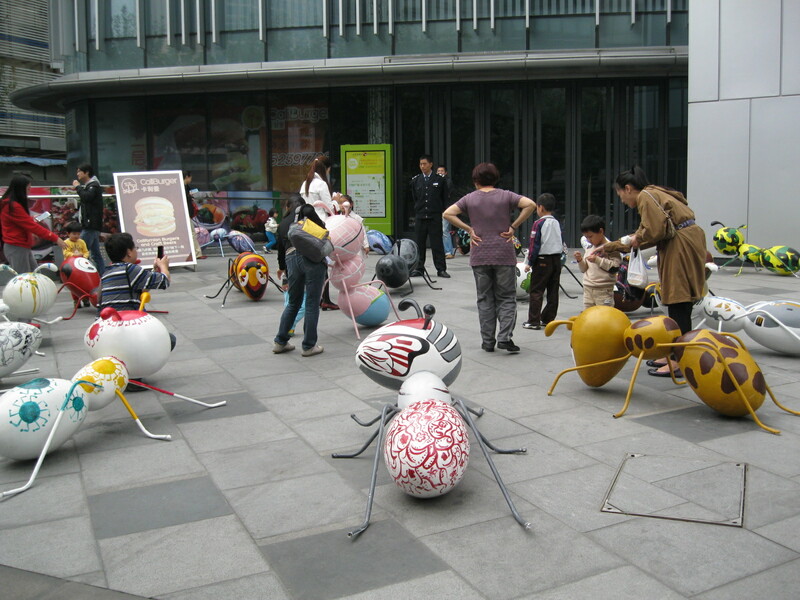 The ants are cute and clearly a big hit with young children, but I didn’t get much in the way of an artistic, or Shanghai-specific, message from them. What’s more notable, I thought, is that 14 years after the first CowParade show, it’s still such a landmark public art exhibit that every major city, including Shanghai, automatically thinks it needs some version of it. Scanning the Wikipedia list of CowParade imitators around the world, it seems that cities usually choose a focus object that has some link to their community (Philadelphia—the Phillie Phanatic, Los Angeles—angels, Austin—guitars). 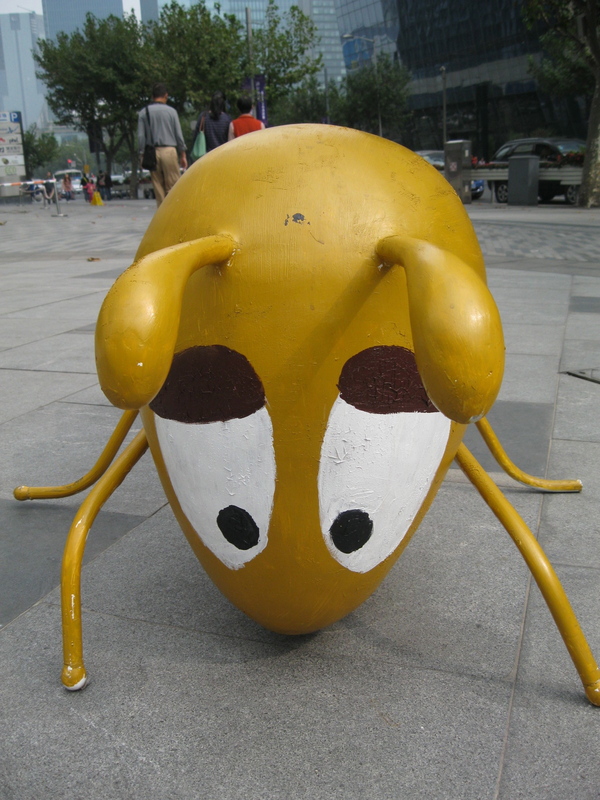 So what do ants have to do with Shanghai? Maybe nobody wanted to paint a giant rat. 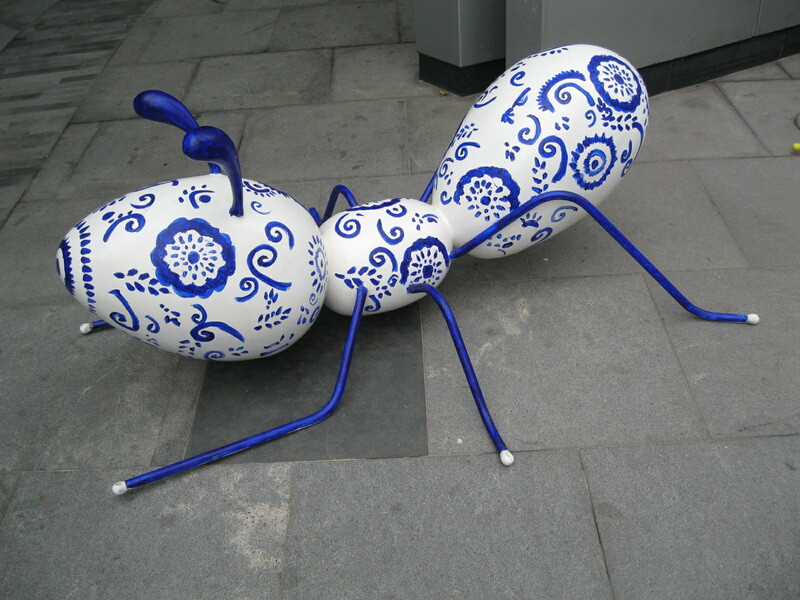 I just want to say, as someone for whom pests have played a totally minimal role in my Shanghai experience so far, I am SO RELIEVED that this is the kind of giant ant your post was referring to. I’m sure there are people with real disgusting bug infestations in their homes here. I’m just glad I haven’t heard about them yet. 谢谢！I tried finding information about them online, but wasn’t sure what to search for in Chinese and didn’t get anywhere in English. Google for “上海 蚂蚁展览”, The first link is the one I post. Amazing google! They’re wonderful!!! How can I buy one:)? I’m sure your neighbors would be thrilled to see an ant sculpture garden in your front yard! I don’t think so—I believe it was just a temporary exhibition.